So you’re going to Disneyland?! Chances are if you’re anywhere remotely near Disneyland Resorts you’re going to end up visiting the parks. I’m not sure if it’s the Southern California spirit but you’ll be shocked how many people visit the park on a whelm. Growing up living 20 minutes away from Disneyland I’ve visited the park multiple times and most of the time it was short notice with little to no preparation. Even when I started going as an adult there wasn’t a lot of information available on how to do Disney. After visiting every theme park we have, it is the one theme park you should plan before visiting. Let’s be honest for a moment, Disneyland and Disney’s California Adventure are not cheap thrills. You should get the most out of your visit. Do plan on visiting both parks and being fully immersed in the experience the entire day. So many people ask “do I really need to visit both parks”? Although they’ve across from each other Disneyland and Disney California Adventure are two totally different theme parks equally yoked with completely different vibes. Different attractions, food, and experiences. Even being a pass holder given the option to always visit both parks it’s hard to decide which to visit first, it comes down to how I’m feeling. Leave it up to the Disney brand to have one of the best most useful apps to help manage your visit and navigate the park. There’s nothing that can’t be done with the app and it is going to simplify your visit. 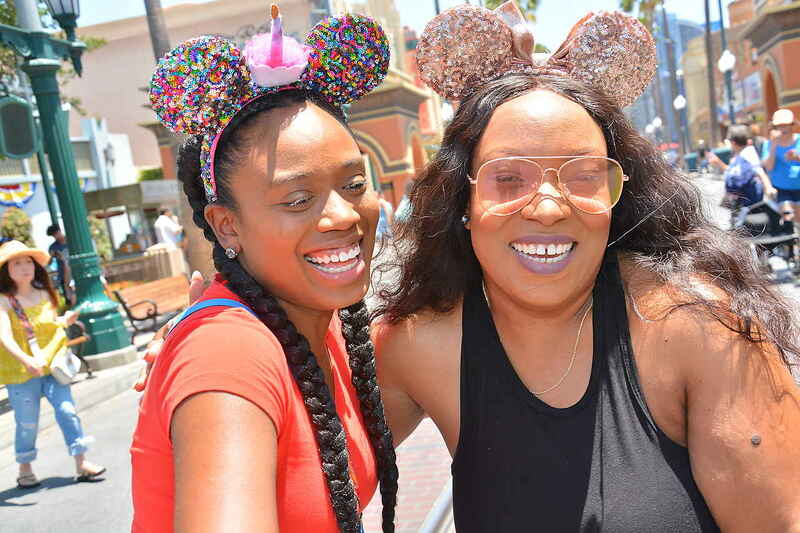 You can purchase and save your tickets along with your guests, order food in advance, check wait times for attractions, get your MaxPass photos, and manage your FastPass tickets. It’s totally worth downloading! My mom isn’t savvy with apps and found a close restroom while we were getting off a ride before we could even find our phones in our bags. Go during the week and other less popular days to yield the best savings, usually about $30-40 cheaper and have less crowds. Summers are crazy so prepare accordingly. Get your hats and shades. Now hear me out on this ticket tip, if you plan on visiting throughout the year it could cheaper to invest in an annual pass. They also do monthly payments here in California which could help ease your pockets even more. Yes! DL and DCA allows you to bring in food and drinks in plastic containers. You’re going to want to eat everything you see at the parks. It’s quite easy to overindulge and blow your food & snack budget doing it. They have a nice amount of healthy options, the pickles, grapes, and pineapple is to die for but expensive. Dining and eating at Disney resorts is a whole ‘nother topic within itself. It’s pretty insane! So save some money and pack your snacks, include some healthy options, grab your water bottle, and plan ahead. I’ve walked in the park with a Big Gulp and hot dog from 7-Eleven and got lots of relatable nods for the $2 combo. We all have a favorite Disney movie, era, or character you can rep during your trip. If you’re going to dress up in your Disney gear, fanny pack, Mickey ears and go anywhere it should be the Disney parks. Everyone owns a piece of Disney mech just check your closet. I grab shirts from Target and Forever 21 because they’re accessible and affordable. I also love custom shirts, a perk to having a graphic designer boyfriend and living near a t-shirt printing shops. Before you even make it inside the park merch can be found at nearby retailers and Downtown Disney. If you plan on getting merch inside the park I’d suggest going to The Emporium or Disney Clothiers, Ltd. on Main Street, USA. I’ve personally had to go to Adventureland inside the park to get Lion King ears that aren’t sold at all the shops in the park. “I want to get on everything!” Usually when I hear this people are referring to riding the major attractions at the parks. Then you have the people that want to do every single attraction. Disney has attractions most have never heard of because we’re so use to hearing about the major ones. Instead of focus being on doing everything, experience things that bring you joy. Make a list of everything you want to see, do, and eat. Make this trip memorable and tackle the rest on your next visit. Main Street, USA at DL and Buena Vista Street at DCA remain open an hour after the parks close. Instead of carrying gifts all day do your shopping the final hour. Split the day. Since re-entry is allowed arrive well before the parks open, take a midday nap in your car or hotel room, then go back until closing. Start collecting your free celebration buttons as soon as get inside the parks. Take pins to trade and locking backs to keep them secure, but do your research in pin trading if you’re starting a collection.